Vet owned and maintained, this bike is clean. Brand new tires, plastics and seat cover. Stop in to our store here in Fort Dodge, Iowa and see it for yourself! 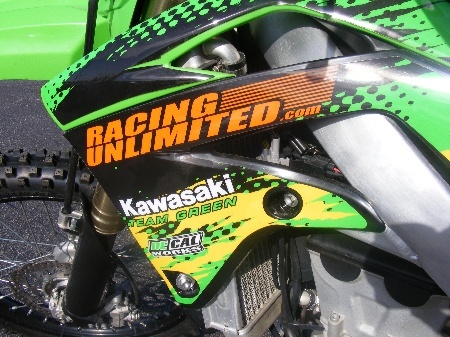 2012 KX™450F highlights begin with the Supercross winning DNA of last year's bike. The advanced design of the aluminum perimeter frame and dominating motor received a host of refinements to create a more compact and mass-centralized chassis propelled by more useable power than ever. Headlining the technological charge, the KX450F features an all new Launch Control Mode, which is tuned to maximize traction out of the starting gate. 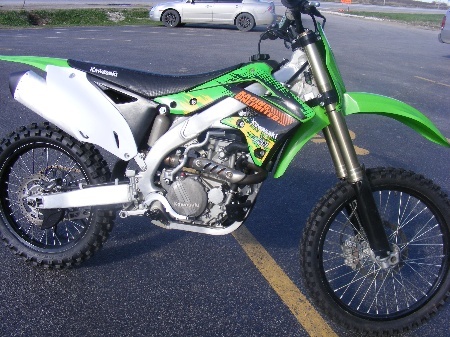 This is accomplished without sacrificing any of the mid-range grunt or straight-line speed that made the KX450F famous. Rake / trail: 26.9 degrees / 4.4 in. Rear suspension / wheel travel: Uni-Trak® linkage system and Kayaba shock with 50mm piston, 22-position low-speed and stepless high-speed compression dampning, 22-position rebound dampening and fully adjustable spring preload / 12.4 in. Uni-Trak® linkage system and Kayaba shock with 50mm piston, 22-position low-speed and stepless high-speed compression dampning, 22-position rebound dampening and fully adjustable spring preload / 12.4 in.